The standard edition provides a complete server solution for small businesses with up to 75 users. It includes Exchange 2010 SP1, SharePoint Foundation 2010, WSUS and of course, the Windows Server 2008 R2 technologies. SBS 2011 Essentials is a more limited and simplified solution for small businesses with up to 25 users. It does not include Exchange, SharePoint and WSUS, provides only core infrastructure services and is designed to facilitate the connection to the cloud. In a series of Screencasts we will present Step-by-Step both editions of SBS 2011. 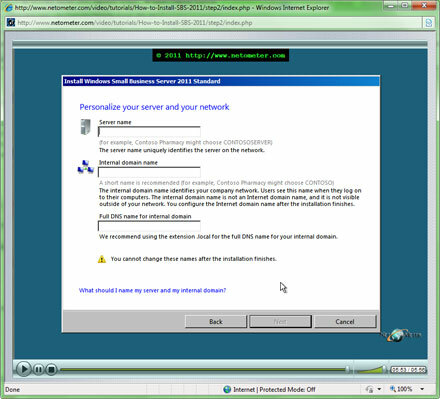 In the following Step-by-Step video tutorial, you will see how to install SBS 2011 standard edition.